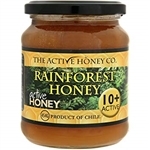 Rainforest Honey contains 100% pure active honey which is harvested from the spectacular forests and mountains of Southern Chile. This unique honey, derived from the native flora of Chile, has special properties which have been prized for centuries by the native Mapuche people. Nelson Honey Manuka Honey is renowned for its distinct flavour and special aroma. Our 100+ icon on the pack indicates a medium level of antibacterial activity which measures a minimum of 100mg/kg of methylglyoxal (MO) tested for by independent laboratories. Nelson Honey Manuka Honey is renowned for its distinct flavour and special aroma. Our 200+ icon on the pack indicates a medium level of antibacterial activity which measures a minimum of 200mg/kg of methylglyoxal (MO) tested for by independent laboratories. Comvita UMF Manuka Honey has been on healthfood shelves since 1974. It is UMF certified which means you can trust that what is on the label is what is in the jar. UMF stands for Unique Manuka Factor; it is a measure of the unique type of activity naturally present in Manuka Honey. The trademark UMF is an independent certificate which measures every batch to ensure you buy the highest quality of honey. Comvita is 1 of only 38 Producers certified with the UMF stamp of approval. 100% pure New Zealand Manuka honey with a UMF rating of at least UMF 15+. Suitable for vegetarians.